Loan customers mis-sold payment protection insurance (PPI) have exactly a year left to make a claim for compensation. The Financial Conduct Authority (FCA) set a deadline of 29 August 2019 for the final PPI claims to be made. So far, £31.9bn has been paid out in compensation, with major banks having set aside another £10bn or so for future claims. As many as 64 million PPI policies were sold from as long ago as the 1970s. The policies were designed to cover loan repayments if borrowers fell ill or lost their job. Not all of them were mis-sold, but sales were pushed on a huge scale to people who didn't want or need them or who could not use them. 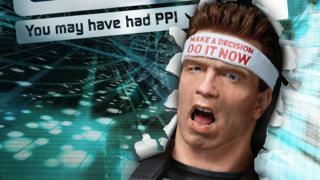 The FCA has been running an advertising campaign, including a demand from the animatronic head of Arnold Schwarzenegger to "do it now", to encourage people to make a claims for compensation if they were mis-sold PPI. The approaching deadline will prompt more calls from the claims management companies touting for business through calls and texts. They take a cut of any payouts made to claimants who use their services, even though people can make a claim themselves for free. Claims management companies, consumer groups and the regulator are also raising awareness of a Supreme Court case, known as the Plevin case, which means 2.4 million rejected compensation claimants may now be able to make a fresh appeal. The court agreed that the company's failure to tell its client that it was receiving a large commission for the sale was unfair. The FCA has ruled that banks should have declared the commission if it was over 50%. This has added extra funds set aside by banks for settling claims. Banks wanted a earlier deadline for PPI claims and are keen to draw a line under the saga.